In spite of no representative substances added, Ha Giang’s thick-peeled oranges can possibly be kept fresh for 30 days. This is thanks to Ms Praphin Sirisawat Lan, an overseas Vietnamese in ThaiLand. The effectiveness of Lan’s method also has been seen in Ha Tay province’s soybeans, Son La’s fresh vegetables and Nghe An’s peanuts. Lan has been invited to give her advice to coffee, rubber planters in Buon Me Thuot. Surprisingly, Praphin Sirisawat’s grandmother once protected and cared for Uncle Ho right in her house. While visiting orange gardeners in Ha Giang, she advised them to apply biotechnology in cultivation. She taught them how to take care of plants and use bio-plant and proplant fertilizer. A few months later, pestilent trees recovered and grew prolifically. Those oranges could be fresh for a month if stored in dry, ventilated areas. Lan’s method was applied broadly over Ha Giang. The local called these oranged, “Ms Lan’s <?xml:namespace prefix = st1 ns = "urn:schemas-microsoft-com:office:smarttags" />Oranges”. Before introducing such a fertilizer to Vietnam, Ms Lan experimented in Thai fields many times to get the most suitable kind for the homeland. Bio-plant fertilizer is not harmful to human and cattle health, and can help increase productivity and reduce losses from pests. Chairman of the Fatherland Front of Vietnam Pham The Duyet tasted Ms Lan’s oranges and called it the “orange of hunger eradication, poverty elimination”. Born in a reputed family in Thailand, Praphin Sirisawat Lan is an enthusiastic fruit grower. The passion was revealed during her visit to Vietnam for the first time in 1993. 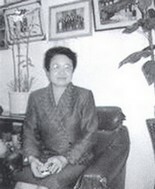 Witnessing the hardship of Vietnam’s farmers, she decided to take part in a royal course on agriculture in 1994. She then did many experiments in Thailand and went back to Vietnam to present her experiences. She is planning to open a school where farmers of Vietnam are taught to become dynamic farmers. Lan is the fourth generation of overseas Vietnamese born and growing up in Nakhonphanong province, Thailand. She was the only child of the family admitted to study Vietnamese. It is a fate that links Praphin with Vietnam. She used to participate in revolutionary activities with Vietnamese soldiers. Her grandmother’s house was a revolutionary base. In that house, Uncle Ho was protected. Now, the house is the Vietnam – Thailand Friendship House where memories about Uncle Ho in Thailand are kept. As Vietnam becomes a member of the WTO in 2007, Lan is thinking of opening a company in Vietnam to promote trade and investment between Vietnamese and Thai businessmen. "... From the beginning of the first century A.D., when the two Trung Sisters rose up to fight the enemy and save the nation, until now, whenever our country has faced danger, our women have contributed whatever they could toward the cause of national liberation. And so, the women of Vietnam from ancient times until now, from South to North, from young to old, are truly heroes ..."